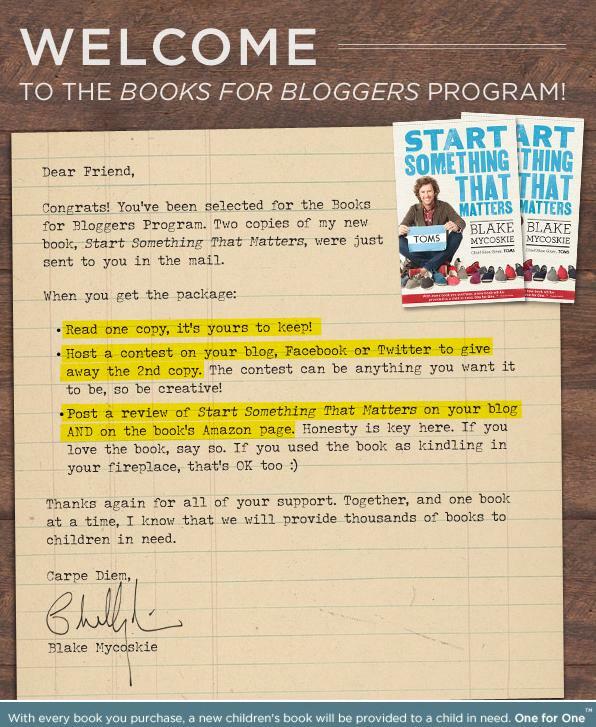 Start Something that Matters…and Win a Free Book! This blog is just over a month old, so it’s high time that I give something back to my tens of loyal readers. And what better for a social media/philanthropy blog than a philanthropy-themed contest promoted via social media? I was fortunate enough to hear TOMS founder and Chief Shoe Giver Blake Mycoskie speak at the 2011 Association of Fundraising Professionals International Conference and was so inspired that I bought a pair of TOMS that night (I even wore them during my wedding two months later!). I want to hear how you’ve done something that matters – something in your community, regionally, nationally, globally, or even at a one-on-one level. The winner won’t be selected because of the number of people he or she influenced, but rather by the originality of his or her inspiration. Frankly, you could have even been unsuccessful in your efforts…results don’t matter as much as passion. Enter this contest by posting a synopsis of how did something that matters in the comments section below (note: your candidacy will be given a boost if you can document your efforts). While I’d love to hear entries via the blog’s Facebook page and/or through Twitter, only those entries submitted as a comment on this post will be considered. I reserve the right to subjectively choose the winner (please be prepared to share your real name and mailing address if you win). This contest will end on December 31, 2011. “Start Something that Matters” is available at Amazon, Barnes & Noble and most everywhere books are sold. No retailer compensates me for referrals, so I’ll let you find the links on your own. Good luck! This entry was posted in Philanthropy, Social Media and tagged Blog, Contest by matthewsm1th. Bookmark the permalink. Great idea. This is tough. While I have a big ego, I try not to let it show. Except of course for naming my blog after myself. 🙂 Here’s my short story. The guy that cleans our building is named Virgil. In the year and a half I’ve been there, Virgil and I would see each other regularly. He cleans at night, coming in about 7 or 8pm (often when I’m leaving) and he gets done about 7 or 8 am (when I’m arriving). He cleans every inch of the building, scrubs toilets, trash, you name it. He’s the janitor through and through. No education by society’s standards, but he’s one of the most intelligent people I’ve ever met. A couple months ago I learned his daughter Jasmine, has Fredrich’s Ataxia (sp?). She’s 15. In the next few years, it will take her ability to walk, speak, move and then her life. No cure. And not much attention b/c it’s so rare. He started Jumpin for Jazz and has engaged help from those in our building. He’s a janitor, working days and nights, with a dying daughter, who’s trying to raise funds and awareness for research and to help kids like Jasmine around the country who need wheelchairs, doctor visits, etc. Being a young nonprofit pro – I felt there wasn’t much I could offer – until Virgil asked. For a few months now we’ve been meeting every Wednesday morning at 7am. We’re working on growing his board, budgeting, donor relations, etc. If nothing else, I’m just trying to offer counsel and a friendly cup of nonprofit mentoring. There’s a lot of drama, politics, finances and other junk that gets in the way when you start a nonprofit. As Virgil says, he’s ‘Jumpin for Jazz’, not for his board, the government (new 990, grants, etc.) or volunteers that offer a lot and then flake. So we work through those things together in order to push the organization forward. I hope and feel that I’m helping. But, as with most service, those early Wednesday mornings are now my favorite too. If you get a chance, check out http://www.jumpinforjazz.org. Awesome story, Nate! Thanks for submitting the first entry…and thanks for being committed to good causes in your personal and professional lives! On December 18, 2010, I gave my right kidney to a complete stranger. I was the 7th of 8 participants in Indiana’s first kidney chain. A bit about what that means: there were families around the state involved. Each family had a person who needed a kidney and a person who wanted to give a kidney, but those two people weren’t a good match (even though they are in the same family). Indiana University Hospital helped coordinate these different families, and started a kidney chain with a man who was willing to give his kidney to anyone (without expectation of anyone in his family receiving a kidney). So, my uncle received a kidney from a stranger who was a good match. And, I gave my kidney to a stranger who was a good match. The entire experience changed my perspective on life, faith, healing, the meaning of family, and the value of community. What an inspiration! Thanks for sharing your story, Jessica! I saw your post on Blake’s page…. awesome idea! Check his page for my post, just a few people after you. It explains more, but you can see it all at http://www.createtobuild.com … good luck! Wow, Lori! What a great idea! Thanks for launching Create to Build…and thanks for sharing your story! Awesome…thanks for visiting my blog, and now I am here at yours! My blog is Ernestine Edna and her Really Big Ideas… http://Www.ernestineedna.com for short. I talk about my really big ideas…like saving the world. You know, cuz I can do that all by myself. Nah, it’s because I can’t change the world by myself that I talk! Right now I’m invested in raising awareness of an organization called Art Feeds from Joplin, MO. You can read about them at http://www.artfeeds.org. I also talk about alzheimer’s awareness, because my mom was recently diagnosed. I also support some amazing indie bands…because they are living out their dreams. Thanks for supporting Blake’s vision! Good luck to all who enter, it’s a great book! And stop by my blog or Etsy store http://www.Etsy.com/shop/ernestineedna to see how I raise funds to support my interests! The contest is closed and the winner is…Jessica Journey! Congrats, Jessica. Look for your book to arrive in a few days, along with a special note from me that you can choose to accept or ignore. Thanks to everyone for your submissions! The world truly is a better place because of you all!